Requirements: The application provides the ability to automatically fill in a pdf document with a large number of fields, to sign it, as well as to send the completed document by e-mail, and save information to the data store. It is also possible to change the language of the application without leaving it. 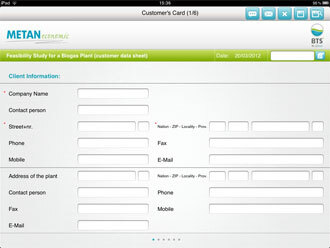 Challenge: The main challenge for our developers was to fill in the fields in the existing pdf document. Solution: Our team has solved the problem of filling in the fields by superposition of a new layer onto the existing document layer. 1. The button lets you change the language of the application without leaving it. 2. This button is used for sending an e-mail with the attached document. 3. Clear button. All fields in the application become empty. 4. Save button. It saves all data. 5. When you click on this button, there appears a table with the stored files.